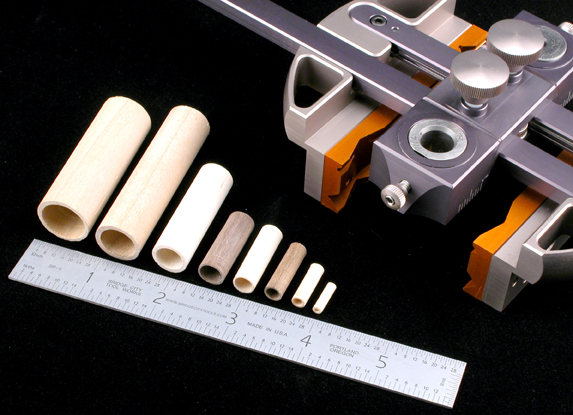 DJ-1 Drilling Jig, Universal Jaws, and Accessory Bushing Set. 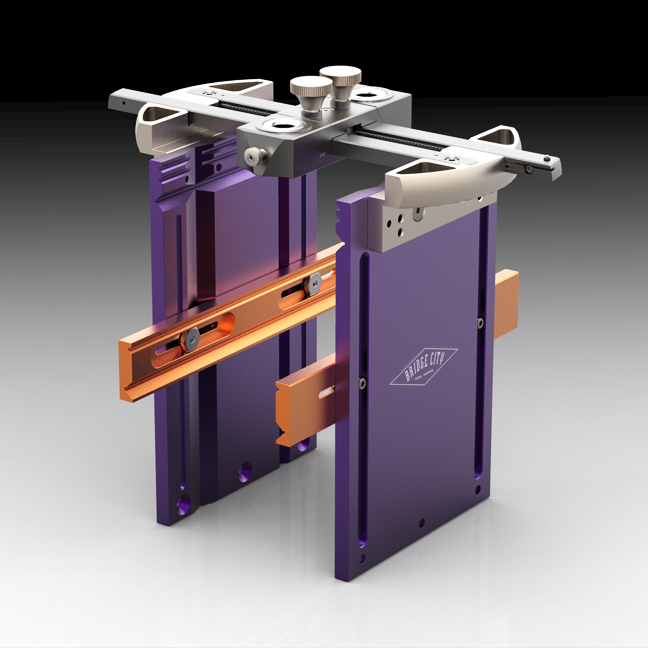 With the help of several DJ-1 owners, most notably Roger Savatteri and Rutager West, Universal Jaws for the DJ-1 Drilling Jig are now a reality. Full details and pre-order information will be posted on our website by weeks end. 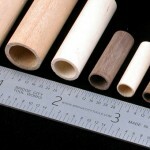 Say you want to drill holes at 17 degrees in square or plank stock. Using whatever protractor device you own, set a T-bevel to 17 degrees (or 73 degrees depending on how your protractor reads). Set one of the orange jaws to this setting (using the purple jaw edge as a reference) and lock the jaw in place. To get the other jaw precisely aligned to the first, simply clamp a dowel between the “V” grooves and the second jaw automatically is aligned and can be tightened. This is FAST and dead-on. Our website will explain the full capabilities but I will share that we are really coming close to eliminating the need for a drill press in most shops. No, the DJ-1 will not hold single wing circle cutters (“knuckle busters” to most) but it will out perform a drill press in accuracy (not much beats the accuracy of bushed twist drill) and in speed. 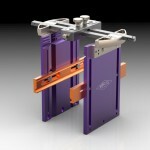 If you own a DJ-1 these jaws dramatically increase functionality. They also serve as a nice foundation for whatever shop-made jaws you might require. These will be made on a pre-order basis and should be delivered by July. As mentioned earlier, our website will be updated later this week. 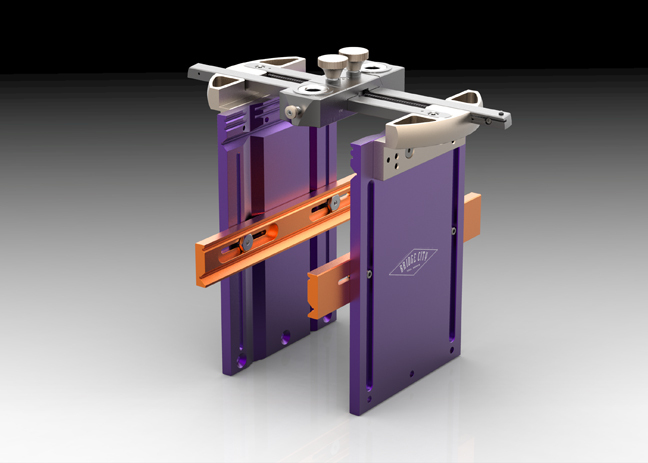 Speaking of the DJ-1 Drilling Jig, we just completed a run and we have a few extras (less than 20 I am told) and they should be available on our website today or tomorrow. The next DJ-1 run will be either the last quarter of 2010 or the first quarter of 2011. FYI. It looks like we will ship Commemorative Tool #16 next week (the Black Chrome Palm Brace). I think we shot ourselves in the foot making this a Commemorative Tool because not only is it completely sold out, we have a lengthy wait list for the overruns. I might rethink how we can remedy this down the road. It’s a good thing we are shipping the 2008 Commemorative Tool soon because I just finished the design work on Commemorative Tool #17 for 2009 (yes, I am behind). All I can spill at this point is the CT-17 is going to be tough to top. You will get to be the judge sometime next week when this tool becomes available for pre-order. Did you know there are approximately 700,000 table saws in America? If you are one of those 700,000 owners and do not have a KM-1, something is wrong with you. Seriously. OK, just kidding, but this tool will pay for itself many times over. Check our website later this week. Speaking of Kerfmaker’s, we are in the process of making a movie to demonstrate the yet to be named “Tenonator“. This tool is awesome–gauge a mortise, cut the the tenon to fit PERFECTLY without once consulting with a ruler/caliper/tape measure/GPS device/or a pedometer. How cool is that? We mentioned a couple of weeks ago our intent to make 50 Stainless Steel Shoulder Planes. We are now accepting pre-orders for the remaining units (those that bought the larger version last year had first crack at this year’s run). I believe we have around 17 units left until we sell out. We know this tool is not for everybody, but it is awesome. We will announce pre-orders for the skeletonized HP-7 soon. I will post the syllabus for my Design/Creativity Workshop before weeks end for those of you on the fence or for those who may be able to get reimbursed as a continuing education expense. 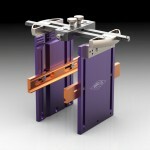 So, after what seemed like an interminable amount of waiting, I received my DJ-1 Drilling Jig this past Monday. Today I thought of a cool little test to see how accurately I could drill holes in the end of a dowel but discovered no dowel rod hanging around the office. Went down to my favorite woodworking emporium to see Carl, (I haven’t seen him since he sold me the plane iron eating volcano wood) but again, he was hiding from me. 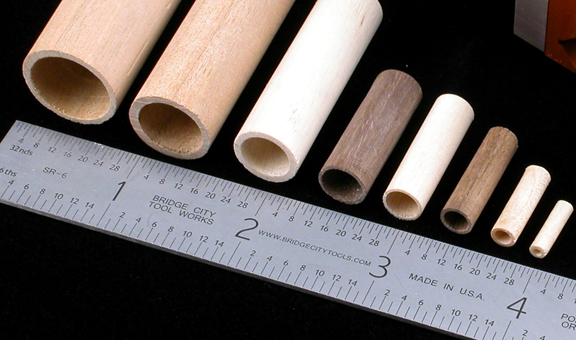 Bought a dowel assortment and in less than 30 minutes my test was complete. It’s hard to believe this kind of accuracy is achievable without any layout using only the lowly hand drill…pretty cool. FYI, twist drills work better than brad points in end grain. Is it as accurate as center drilling on a lathe? 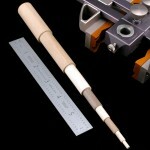 Probably not, but it is damn close, and without the lathe. As I babble I suspect you are thinking of project ideas that range from magician illusions to illegal substance abuse– yes/no? The DJ-1 has its own forum here. And we will give $100 BCTW gift certificate to any DJ-1 owner who posts a pic of the custom jaws they created to solve a drilling problem. Now that is what I call free money. The Economaki Prize will be awarded to the first person who discovers a new oil field (1 million barrels of oil, minimum yield) using only the DJ-1 and a hand drill. I know I could win it but I am not interested in winning my own money. By the way, I used the DJ-1 and a hand drill to install a pacemaker in my golfing buddy yesterday–worked great! Don’t recommend brad points here either… Going to try a lobotomy on Louie dog later. Did you know that we have a forum dedicated to the discussion of design? You can check it out here. And, if you are so inclined, we would love to have you share your work. What is refreshing about this moderated forum is the lack of moronic posts (present company excluded) and the deemphasis (isn’t that a weird looking word?) of technique discussions. We hope you participate. Well, I have thousands of unrelated thoughts I want to share but I have to return a call to the IRS–if this is what I think it is, you better find that oil field fast. 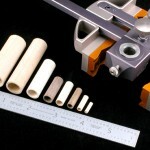 After the JMP went into production about 9 months ago, I set my sights on the next silent woodworking tool. My goal was to create a tool that would allow users to do gallery quality work with as little effort as possible. Some of the things you are about to see you likely have never seen before. Actually, neither have we. PS: This may not be up on our website yet, but the DJ-1 is a “make to order” item requiring a deposit. Cutoff for ordering is May 20 and delivery will be 6-8 weeks later depending on volume. Afterwards, we will begin a new wait-list similar to the one now accruing for the second run of the Jointmaker Pro.